This July 2015 Forrester Research report is provided compliments of HP. Modern application delivery leaders realize that their primary goal is to deliver value to the business and its customers, faster. For many, this is a significant shift from the past, when they primarily focused on cost control and efficiency. Today, they must connect the work they do and the results they produce to business outcomes. To do this, application development and delivery (AD&D) leaders use a new set of metrics that help them monitor and improve the value they deliver, based on feedback from business partners and customers. 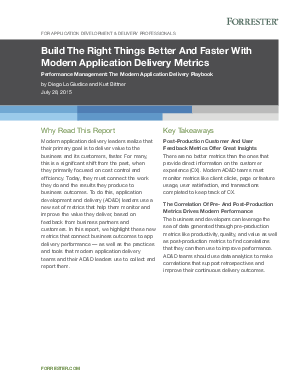 In this report, we highlight these new metrics that connect business outcomes to app delivery performance — as well as the practices and tools that modern application delivery teams and their AD&D leaders use to collect and report them.